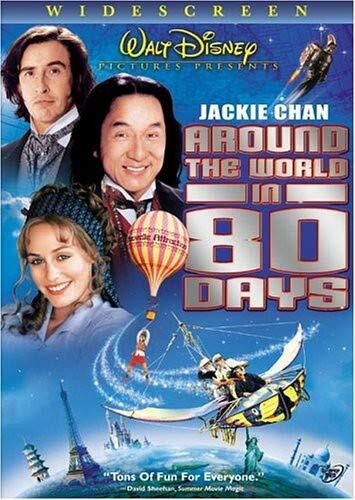 Jules Verne might have a hard time recognizing his source material in the Jackie Chan action-comedy adaptation of Around the World in 80 Days, but for non-purists, it's easy to forgive the many liberties taken in this funny, fleet-footed summer-matinee romp. But director Frank Coraci (The Wedding Singer) shows enthusiastic creativity in pulling it all together and giving the comedy time to breathe by, for example, transitioning quickly between episodes with imaginative, cartoonish-watercolor CGI flyovers taking us from one exotic locale to the next. DVD Details: Disney's kid-friendly DVD comes with an alternate opening, deleted scenes, a behind-the-scenes featurette, a second behind-the-scenes featurette about the stunts, cast and filmmaker commentary, a Dave Stewart music video, optional French and Spanish language tracks and optional French and Spanish subtitles.